Description: The River Trails are a city park in North Lawrence maintained almost exclusively by LMBC volunteers. 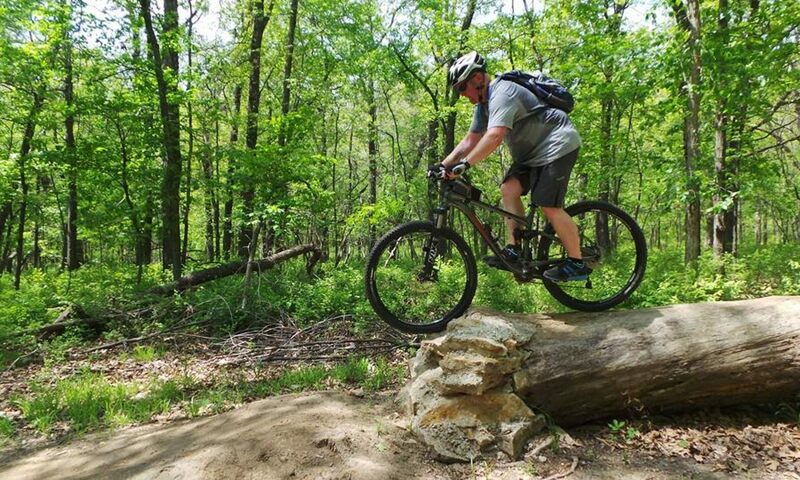 This very popular trail is used by bikers and runners year round. The 9-mile loop has separate marked entrances for bicycles and pedestrians, directing each group on their appropriate one-way loop. Bicycles should take the clockwise route. Location: The park entrance and parking lot is just off 8th & Oak streets in North Lawrence. Check Google Maps for interactive driving directions. Directions: Going north on Massachusetts street from downtown, take the first right (east) over the bridge onto Elm street. Follow Elm to 8th street. Turn right (south) onto 8th, and cross over the levee. There is a parking lot between the levee and the Kansas River. By bicycle from downtown, ride east on the levee approximately one mile. Interactive Trail Map by Jason Downs, Downs Geomatix, LLC.